With the real world lacking in loot, Marc Owens set forth on a project to make it appear more like an MMO, by crafting himself a suit that would look more at home in WOW than on the BUS. 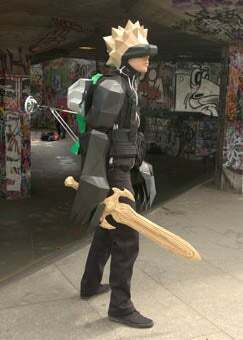 Owens' built his"Avatar Machine" costume to "[replicate]the aesthetics and visuals of third person gaming, allowing the user to view themselves as a virtual character in real space via a head mounted interface." Which means...yeah, you guessed it. "The system potentially allows for a diminished sense of social responsibility, and could lead the user to demonstrate behaviors normally reserved for the gaming environment." That's all well and good, but we just want to know one thing: can you make us one, Marc?